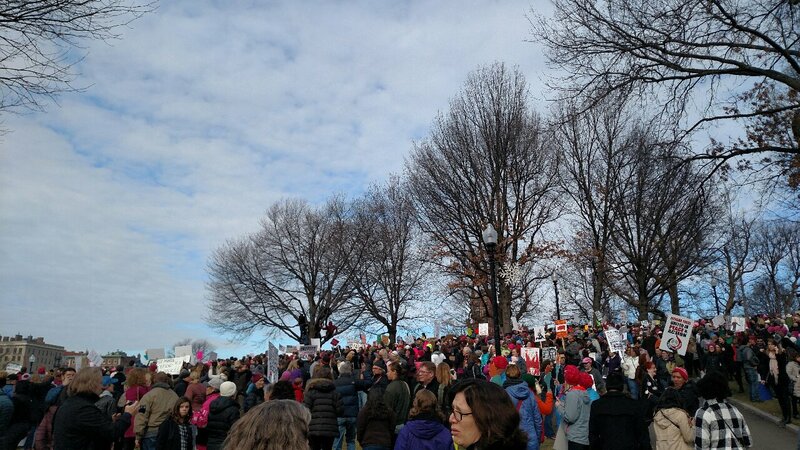 Participating in the Women’s March in Boston on January 21, 2017, with the multitudes of people got me to thinking how we, as human beings, are all connected. We are all connected – like it or not. In that multitude of people, I was surrounded at one time on all sides. There were thousands of people in front of me, to the side of me and to the back of me. I had initially hung back from the crowd and found a place to stand behind a barrel just off a walkway through the commons. Then a friend, who I didn’t know was attending, came up to me and I ended up following her to her daughter and grandson who were deeper into the mix of people. We could hear the speakers, but not see them. In the multitudes of the Women’s March, I didn’t feel panic but I did see so clearly how interconnected we are. If anything had set off anywhere at the rally, it would have rippled through the crowd and we would have toppled like dominoes or had to join hands moving one step at a time to rescue others or ourselves. We were an embodiment of the human organism on the planet Earth. We were women, men and children; youth and mid-lifers and elders; people of all physical abilities; people of all sexuality and lifestyles; people of many religion and spiritual practices; agnostics and atheists; people representing virtually all the major tribes of the earth, come together to protest and to be counted. I have written before that I believe God is an infinite mirror who reflects each of us and I felt a clear spiritual message on January 21, 2017: we are all connected; we are all in this together. I know that we were purposely made or creatively evolved to be diverse and unique – no cookie cutter people. I felt this truth from my head town to my toenails and all my organs between. I felt it in my blood and my soul. Even in our separate cultural practices, even in the different places and ways we live, we are connected. Finding ways to move beyond co-existence to respect and love and conscious interdependence is our purpose and struggle. The Women’s March impacted everyone – those of us who attended and those who bore witness on social media and TV. It impacted people working at nearby businesses s and restaurants; T personnel; and the police officers who worked to guide traffic and keep the event a safe one. It probably impacted everyone but Trump. I’ll share my thoughts about that in another post. I have made another decision as I reflect on what I witnessed on Saturday: I will rally, march and be active for something and someone not against something or someone. Being for positive things is where it’s at. It was quite an amazing event. We got there very late as the T was packed at Davis where we got on. We did not get anywhere near the speakers and waited until 2 to march and finally gave up. But Im so glad I went–and sorry we did not connect. And Im glad you went too! You had quite a journey getting there. I am glad you finally made it and bore witness. I never saw any of the people I knew were there, I’ve found out since about other people who were there that I didn’t see – such was the crowd. I also felt surrounded by positivity and met no strangers then. As a veteran of demonstrations, I know you know that feeling. Thanks for reading and commenting. Fight the powers that be. Thanks for reading and leaving a comment.